Three entries at once here. First, a dress uniform from a personal project. 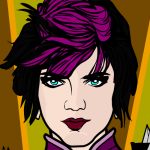 They are rather individualized, but this is the one for the main character (named Aura. I’m sure she’s shown up before lol). Second, I did a couple of concept ideas for a costume I was making. I didn’t end up doing either of these, but they turned out pretty good.